Dubai Duty Free at Dubai Int'l Airport had its annual sale on December 20th, only one-day offer. This year is its 24th anniversary so all items were on sale at 24%. I wish I was there but unfortunately I got there (Dubai) on December 19th and left on 21st. Next year if it has 25% offer, I'll be there. A few days ago I came across this poster for the upcoming election in December. 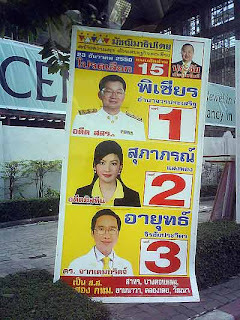 What I liked about this poster was the comment under each candidate's picture. Under the picture of candidate No. 1 it says "ex-member of constitution drafting committee." Ok, he has some experience in politics. Now let's see candidate No. 2, under her picture it says "ex-Miss Teen". Do we need an ex-Miss Teen for this job? Doesn't she have any better qualification to put there?